We began serving the community when a small group of Lutherans started the cemetery in 1929, when the landscape was dirt roads and sprawling farmland. Now, after 87 years Glen Eden continues serving families of all Christian faiths with the highest standards of individual care and understanding. Non-profit strongly endowed and financially secure, an endowment trust fund provides the resources for Glen Eden’s perpetual care and quality of service, securing its place in our community for generations. Glen Eden’s mission is clear and is a written promise to each family it serves. A blending of nature and art creates an atmosphere of peace and tranquility that comforts families visiting Glen Eden. Inspirationally designed landscaping, enduring monuments and the highest standards of architectural design create an inviting, spiritual oasis. A design of natural beauty, reflecting a closeness with nature, and so a closeness to God. Everyone wants to be remembered. A permanent memorial acknowledges life and is a personal reflection of the life led. Christians strongly believe in families and a permanent tribute provides future generations a setting to remember loved ones and preserve family history. Glen Eden’s promise is to endure throughout the generations. Glen Eden offers Christian burial and inurnment for people of all Christian faiths. Whether it’s visiting often or taking the opportunity to drop by, families are uplifted being able to stay connected to loved ones. Preplanning at Glen Eden offers you and your loved ones peace of mind. You’ve provided emotional and financial security for your family. And they will take comfort knowing your wishes are honored. Nowhere will you find more choices of the finest and most dignified memorialization selections. Affordable options, all clearly presented, will be made available for your caring and considered decisions. We encourage your desire to create an enduring memorial that is both fitting and distinctive. Glen Eden is committed to providing a full range of quality products and services to families. Tailored assistance with individual choices is what you’ll receive at Glen Eden. Our Memorial Advisors are caring professionals who will fully and clearly explain all of your options. Having worked with virtually every family preference and individual situation, they’ll guide you through the selection process so you’ll feel certain you’ve made the choices that are right for you and your family. Like making a will or buying life insurance, pre-planning your memorialization provides emotional and financial security for your family. Planning now protects your family from unnecessary burdens at their time of grief; ensures choices you’re comfortable with; and protects your family from future price increases. Whether you choose traditional burial, above ground entombment or cremation, Glen Eden’s knowledgeable memorial advisors will fully explain the benefits of pre-planning so you will be completely comfortable with your decision. • Dr. Mark Halboth, D.D.S. The following rules and regulations have been adopted as a guide to the use and management of the cemetery. The rules and regulations will help protect all who have interest here. All lot owners of interment rights, visitors and contractors performing work within the cemetery shall be subjected to said rules and regulations, amendments or alterations as shall be adopted by the Board of Directors from time to time. 1. Rules and regulations of the cemetery and prices for burial spaces and services are made by the Board of Directors, and become effective upon approval by the Board. The cemetery may, and it hereby expressly reserves the right, at any time, with or without notice to lot owners, to adopt new rules and regulations or to amend, alter and/or repeal any rule, regulation and/or article, section or paragraph in these Rules and Regulations. Special cases may arise in which the literal enforcement of the rule may impose unnecessary hardship. The cemetery, therefore, reserves the right, without notice, to make exceptions, suspensions or modifications in any of the Rules and Regulations when, in its judgment, the same appear advisable, and such temporary exceptions, suspensions or modification shall in no way be construed as affecting the general application of such. 2. The cemetery retains to itself, for the benefit of all interment rights owners, full and complete supervision, control and management of the land, buildings, improvements, roads, walks, utilities, development, books and records, and the full and complete authority, rights and privileges to make, change, administer and enforce all rules and regulations and restrictions not inconsistent with the laws of this State herein this cemetery is located. 3. All lots in the cemetery are sold in accordance with the provisions of the laws of the State of Michigan and shall not be used for any other purpose than as a burial place for dead human beings. All lots are sold with permanent maintenance provisions. 4. Lots must be paid in full before a burial is made. Full purchase price must be paid before a certificate is issued. 5. Visiting hours are from 8:00 a.m. to 8:00 p.m., Monday through Saturday from April 1 through October 31. Visiting hours are 9:00 a.m. to 8:00 p.m. on Sundays and holidays from April 1 through October 31. Visiting hours are from 8:00 a.m. to 4:30 p.m., Monday through Saturday from November 1 through March 31. Visiting hours are from 9:00 a.m. to 4:30 p.m. on Sundays and holidays from November 1 through March 31. Any person found on the cemetery grounds after closing will be considered a trespasser. 6. The cemetery issues to each owner of lots, crypts or niches a Certificate of Ownership describing the location and naming the owner or owners of the said location. The naming of more than one owner is indicative of joint ownership in common with rights of survivorship. 7. The owner of interment rights hereunder may dispose of same by will, or should the owner die intestate, such interment rights shall pass according to laws of this State governing intestacy. Provided however, the cemetery shall not be bound by such transfers unless and until an exemplification of record of same has been presented to it and such change has been recorded on the books and records of the cemetery. Any plot, crypt or niche in which there are no burials, entombments or inurnments may be transferred to a new owner, providing the original Certificate of Ownership is submitted to the cemetery together with proper transfer agreement, upon payment of transfer fee in accordance with the cemetery’s established schedule of charges. 8. In the event of loss or destruction of a Certificate of Ownership and upon the presentation of a written request, accompanied by a properly executed affidavit by the owner, the cemetery will prepare a Lost Certificate Form solely for the records of the cemetery. 9. Lot owners are prohibited from allowing interments to be made on their lots for compensation. Only veterans and their spouses are permitted to be interred in the Garden of Valor. 12. No person, other than employees of the cemetery, shall be allowed to perform any work within the cemetery without management approval. 13. The cemetery shall direct all improvements within the grounds and upon all lots before and after interments have been made therein. 14. Charges for work and services performed by the cemetery or for materials purchased from the cemetery will be at rates as approved by the Board of Directors. 15. The cemetery will take all reasonable precautions to protect lot owners and their property within the cemetery from loss, damage or injury, but it shall not be responsible for any loss, damage or injury. 16. The use of the cemetery lands as a thoroughfare will not be permitted. 17. The right to use automobiles or other vehicles in the cemetery is authorized solely and exclusively for the purpose of transporting person(s) to visit burial plots. The speed limit within the cemetery is fifteen (15) miles per hour. Parking and/or driving on any gardens or grassy areas is prohibited. For purposes other than those mentioned, special authorization must be obtained from the cemetery. 21. No signs, notices or advertisements of any kind shall be allowed in the Gardens unless placed by the Cemetery. 23. Interments into a lot are restricted to those entitled to burial therein, according to these rules and regulations. 24. The cemetery shall be in no way liable for any delay in the interment of a body where a protest to the interment has been made, or where the rules and regulations have not been complied with; and further, the cemetery reserves the right, under such circumstances, to place the body in the receiving vault until the full rights have been determined. 27. Funerals are to be at the cemetery by 3:30 p.m. Monday through Friday and by 1:00 p.m. on Saturday. Cremation interments on Saturday must arrive before 11:30 a.m.
28. No disinterment will be allowed without permission of next of kin, the lot owner, the cemetery and the proper authorities in compliance with Section 333.2853 of the Michigan Cemetery Law. 29. The cemetery shall be in no way liable for any container, receptacle or urn of cremated remains placed in any lot, crypt or niche. A permanent type of urn or vault is required for ground interment of cremated remains. The scattering of cremated remains over a family lot is prohibited. 31. Fresh flower arrangements are allowed on lots in a permanent bronze vase or a disposable vase. Silk flower arrangements are only allowed to be placed in a permanent bronze vase. 32. Grave blankets and wreaths are allowed as winter decorations from November 1 to the Spring cleanup beginning March 1. 33. Items not allowed to be placed on a lot within the cemetery include, but are not limited to, the following: plants, plantings, shepherd’s hooks, standup decorations, coping, curbing, decorative rocks, fencing, hedging, grave mounds, borders, or enclosures. No decorations of any type are permitted in trees or plantings. 34. Flags may be placed on graves on Memorial Day, the Fourth of July, Flag Day and Veterans Day. Flags should be kept to 12” by 18” in size or smaller. Flags are subject to removal by the cemetery within ten (10) days of the holiday. 35. Trees and shrubs are placed throughout the cemetery by the cemetery for overall beauty and serenity of the grounds. Individual lots are not permitted to have trees or shrubs. Any such tree or shrub not approved by the cemetery will be removed without notice to the lot owner. 36. Certain lots embrace a tree that may interfere with burial space that otherwise might be used for burial. In such a case, the cemetery recognizes that the right to the retention of the trees as prior to the right of use of such space for burial. Should any such tree die naturally, the cemetery will remove it at its own expense. 38. Devotional lights of all types are prohibited in the cemetery. 40. All memorials must be made of the highest quality standard bronze approved by the cemetery. 41. The cemetery shall have the authority to reject any memorial, which on account of its size, type, design, inscription, quality, color and method of construction is unsuitable for the particular lot or grave on which it is to be placed. The cemetery reserves the right to prevent the placing or to remove any marker or other objects which do not comply with the standards of the cemetery. Also, the cemetery reserves the right to require the purchase of any and all markers from the cemetery or approved producers or retail dealers. 42. No marker will be accepted by the cemetery for installation unless a sketch has been furnished, defining the dimensions, material content and lettering and permission of the lot owner or proper agent of the person having burial rights in the grave to be marked. 43. All fees or encumbrances due on a lot must be paid in full prior to any memorial being placed on the lot, including any installation fees. 44. In the event a memorial is placed where it is necessary to remove it for an interment, or disinterment, the cemetery shall have the right to remove such memorial without notice to the lot owner. 45. The cemetery may, at its own expense, without any liability, correct any error that may occur in the placing of a foundation or memorial. 46. Memorials shall be set in accordance with the general plan of the cemetery. Not more that two (2) memorials may be placed on a grave. One at the head and the other in the center of the grave, unless otherwise approved by the General Manager or Superintendent. 47. Photographs and porcelain material may be incorporated into any memorial, upon approval by the cemetery. No protective glass or breakable material of any kind will be allowed on the memorial. 48. All entombments or inurnments in the mausoleum must be performed by regular employees of the cemetery. All bodies to be entombed in the mausoleum must be embalmed. 49. Such entombments must be made in a casket understanding the crypt dimensions are 2’6” wide by 2’2” high by 7’2” deep. All caskets will be placed in protective outer enclosure for the safety and sanctuary of the casket. 50. The cemetery will provide all inscriptions, lettering or crypt plates on the crypt or niche fronts to ensure uniformity. Either a floral tribute area or vase will be provided for each crypt. 51. The cemetery reserves the right to limit floral tributes. Only one floral tribute per crypt or niche are allowed to be placed on the benches or other holders, where provided. Floral displays, placed in a vase affixed to the crypt front, shall be limited to items of eight inches (8”) in height and six inches (6”) in width. Also, only one floral tribute per crypt or niche is allowed unless an additional vase has been placed on the crypt or niche front. 52. The cemetery reserves the right to remove all flowers, wreaths or other decorations from the mausoleum as soon as they become unsightly. The mausoleum will be cleared of decorations once a year. The annual cleanup will begin March 1. In order for a family to save any decorations placed in the mausoleum, the decorations should be removed prior to this date. New decorations may be placed beginning April 1. Winter holiday decorations will be removed in January by cemetery personnel on a date posted at the cemetery. 53. Visiting hours are from 8:00a.m. to 8:00 p.m., Monday through Saturday from April 1 through October 31. Visiting hours are 9:00 a.m. to 8:00 p.m. on Sundays and holidays from April 1 through October 31. Visiting hours are from 8:00 a.m. to 4:30 p.m., Monday through Saturday from November 1 through March 31. Visiting hours are from 9:00 a.m. to 4:30 p.m. on Sundays and holidays from November 1 through March 31. Any person found in the mausoleum after closing will be considered a trespasser. 54. No decorative objects or photos may be affixed to the crypt fronts by tape or other means. No toys, glass containers, ceramic containers or objects of the like shall be permitted in the mausoleum. All such unauthorized items will be removed by the cemetery without notice. 55. All niche spaces in the mausoleum are intended for an individual and/or double inurnment. A container of suitable material is required. A permanent urn approved by the cemetery must be used for all inurnments in any niche with a glass front. 56. 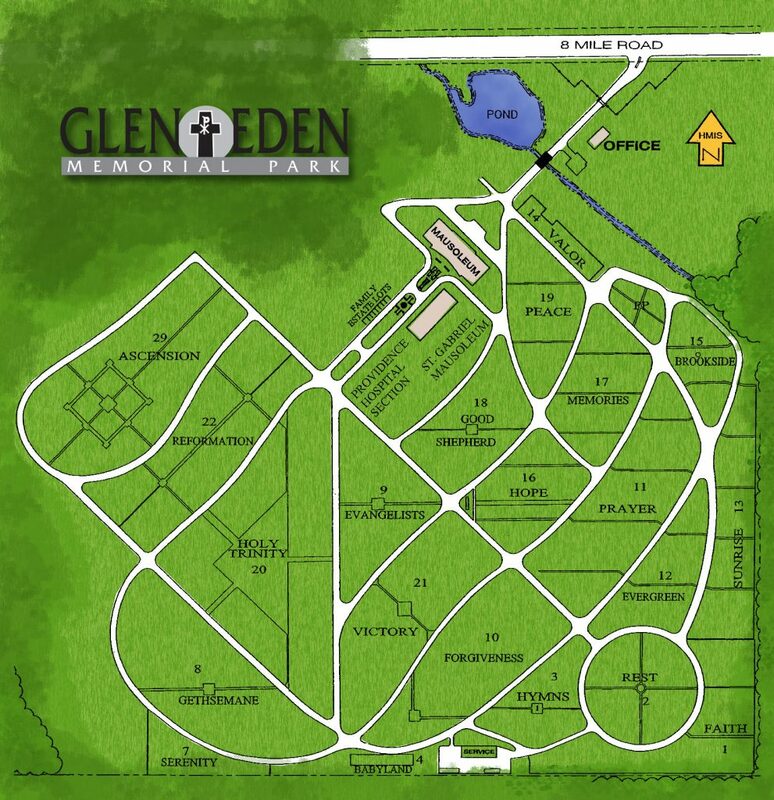 Shared Monument Section — Glen Eden has a special garden that allows upright granite monuments and granite markers. Monument lots are of two and four grave configurations. The cemetery owns the monuments. Families are purchasing the burial rights and inscriptions rights only. The cemetery reserves the right to select size, color and shape of all monuments and grave markers. Monuments are allowed on designated two and four grave lots only. Single graves are available in designated locations. Permanent vases are only permitted on upright monuments.